The white flower arrangement with glass consists of a transparent glass jar with white wicker flowers floral arrangement. 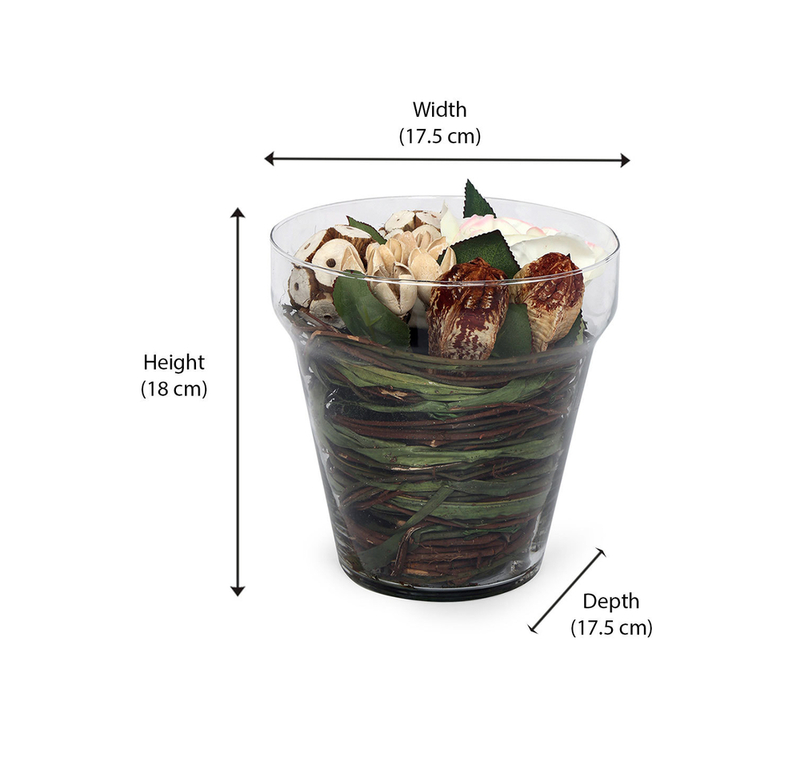 The jar is 17.5 cm in width, 17.5 cm in depth and 18 cm in height giving it a very balanced view. The glass is transparent and there is no lid on the jar. The flower arrangement with glass helps you accessorize your home and rooms. The planter goes along with all possible décor themes and accentuates the background and possible additions to the décor. The white colour is a calming presence and represents peace which can be a representative of the residents and also soothe visitors. Real potted plants need sunlight, water and have to be treated to keep the bugs and insects away. This flower arrangement solves the problem and is maintenance free alternative. The white floral arrangement adds character to the room it’s in and is a great way to complement any other colours you may want to add to the setting and even in absence of coloured décor accessories the white colour does not become in your eye loud and is more of a passive presence. The jar on the other hand can also come handy for anything you may want to do. Buy Flower Arrangement with Glass, White from @home today.